The story of the creation of the Moon is still the subject of intense debate. The scenario of a giant impact is only one hypothesis among others. This hypothesis was formulated in the mid-2000s. We imagine that the Earth was hit by a planet the size of Mars, called Theia. Part of the Earth’s mantle would have been sprayed into Earth’s orbit. This matter would then have agglomerated to form the Moon. The samples brought back from the Moon show that the material of which it is composed is very similar to what is found on Earth, which confirms the hypothesis that at least some of these materials used for its formation come from our planet. This chemical and geological evidence is, however, not sufficient to eliminate other hypotheses. For example, we can imagine that the Earth and the Moon were formed at the same time with the same material. This would explain their chemical similarity. On the other hand, this hypothesis does not explain the difference in density between the Moon and the Earth. We can also imagine that the Earth and the Moon are both from a gigantic impact between two celestial bodies. For the moment, the hypothesis of Theia is favored by the scientific community. But that could change with the return of samples from the Chinese mission Chang’e 5. The Moon is rich in oxygen, iron and aluminum. It also has significant reserves of titanium. Helium 3 is the resource that generates the most interest. The solar wind has bombarded lunar soil for billions of years with this isotope. It is thus mixed with the regolith directly on the surface of the Moon. Helium 3 is thought to be a very good fuel for nuclear fusion. The helium 3 resources on the Moon have been estimated at 100 thousand tons, which could supply humanity with energy for a few centuries in a fairly clean way. 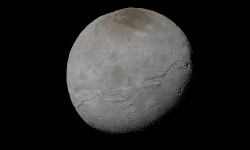 However, helium 3 is a fossil fuel, so reserves are limited. Collecting all helium 3 would require collecting and sorting the regolith over most of the lunar surface. It would then be necessary to bring it to Earth, which would be a huge challenge. That would be much more expensive than what it would bring, especially since commercial thermonuclear reactors will not be ready for decades. 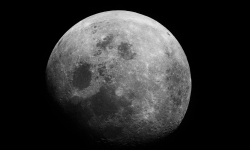 At present, it is difficult to identify a lunar resource that is cheaper to bring back to Earth than to find on Earth. The simplest is to consider the Moon as a huge gas station to project us further into the solar system. Almost all space agencies have decided to make the Moon a priority for human exploration. A study published this summer by a team of US researchers may increase this interest. Since the 1960s, the Moon has been suspected of having water ice reserves in its polar regions. This theory could not be demonstrated so far. This is now the case, thanks to the data of an instrument installed on the Chandrayaan-1 space probe. The US team was able to identify absorption lines in the near-infrared, indicating the presence of water ice. This water has taken refuge in craters that are never exposed to sunlight. This explains why it took so long to detect it. The observations were made from minute amounts of residual light. The team at the origin of this discovery think that the ice arrived in these regions by condensation of water vapor, perhaps following impacts. The location of the ice in small scattered areas is very different from what is found on other bodies of the solar system, such as Mercury or Ceres. in any case, it is excellent news for all those who hope to see one day a permanent installation of the man on the Moon. The presence of water would not only allow astronauts to drink, but especially to produce locally propellant for their rocket engines. In the same region there are peaks exposed to very good illumination conditions, which could make solar panels highly profitable. With water and energy, much of the equation of human survival is already solved. 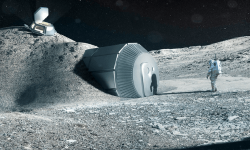 In Europe, we even think about how we could transform the lunar regolith into a building material. The Moon is covered with fine dust, sometimes several meters deep. This dust can be agglomerated into bricks, and even used directly for 3D printing of structures. An ESA team managed to print a 3D structure from materials very similar to the lunar regolith. Lunar dust is generally seen as a brake on human exploration as it infiltrates everywhere and represents a risk to the health of astronauts. But with a little ingenuity, it may be this same dust that will protect them from radiation and extreme temperatures encountered on the surface of the Moon. The Moon interests Americans, Europeans, Russians and Chinese. We have certainly not finished hearing about studies on local resources and how to use them. Let’s hope that this research effort will eventually lead to a real situation. Meanwhile, by the end of this year, the Chinese mission Chang’e 4 will learn a little more about the poles of the moon. A team of researchers at Brown University is convinced that the Moon is full of water. The team relies on the analysis of data retrieved by the Indian probe Chandrayaan-1, published in the very serious journal Nature. This journal does not usually publish scientific articles without foundation. It seems therefore that this theory must be taken seriously. But a Moon full of water goes against all our models and everything we know about the Moon. The Moon is thought to have formed after a collision between the Earth and another planet the size of Mars. The cataclysm would have left enormous amounts of debris which, by gravitational attraction, would have eventually regrouped to form the Moon. It would have happened about 4.5 billion years ago. The problem is that a cataclysm of this magnitude should have heated the debris to unimaginable temperatures. He would have evaporated all traces of water before the moon was formed. This is not the first time scientists have come up against these lunar water problems. In 2008, Alberto Saal, also a researcher at Brown University, analyzed samples from the Apollo 17 mission. The samples were 100 times richer in water than the models predicted. Analysts of the Chandrayaan-1 probe confirm that this phenomenon will affect the entire lunar mantle. Water is not present as a lake or ocean on the Moon, which is far too cold for that. It would be rather a kind of general humidity of the lunar mantle. We still can not tell if ice could form on the Moon. In any case, this is good news for explorers. Water is absolutely necessary to maintain a human presence in space, and it has always been thought that the Moon was completely devoid of it. Maybe the next men on the Moon will know how to exploit this water to make the Moon less hostile. To learn more, it is hoped that the Chinese will be ready to communicate on their results. Indeed, China has made the Moon one of the priorities of its space program. As early as December of this year, the Chang’e 5 mission will have to bring lunar samples back to Earth for the first time since the Apollo missions.